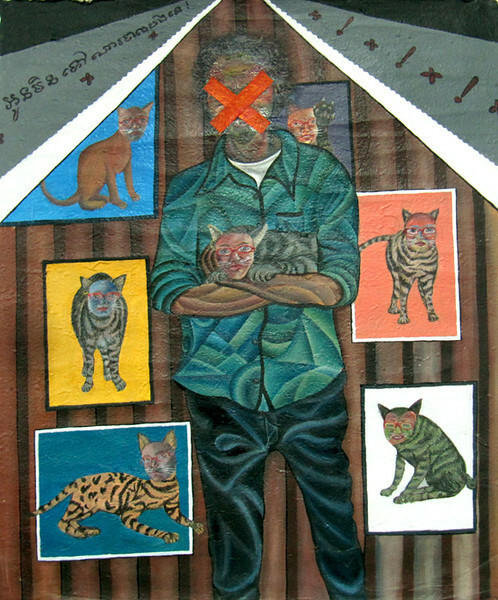 Oeur Sokuntevy, also known as Tevy, is one of the most established contemporary artists in Cambodia. By advocating self-expression and individuality, the young woman challenges traditional Cambodian notions of the role of women in society, as well as the traditional relationship between men and women. “I don’t want to follow rules”, she says. Her art is an impassioned exploration to determine her place as an independent woman and artist in modern Cambodian society. The outspoken artist often tests the limits of what is acceptable in her conservative, Buddhist home country, by touching on issues such as sexuality. For Tevy, sexuality and family are the cornerstones of ‘female identity’. Many of her candid, explicit works are inspired by her own experiences. While her subject matter is highly individual and bold, her paintings - mainly acrylic on paper - use elements found in traditional Cambodian folk art. Oeur Sokuntevy, You are like a Cat, 2009, acrylic on handmade paper, 19 X 22 in.